Was Ist Das? is promoting again after an Autumn sabatical. Girl Sweat have been thwarted in their attempts to play so stepping into the breech is acclaimed solo guitarist Dean McPhee. His album “Son Of Black Peace” on Blast First Petite won him rave reviews from such disparate sources as The Wire, Record Collector, Drowned In Sound, Mojo and even Pop Matters who said it was “as devastatingly beautiful as Michael Chapman’s Fully Qualified Survivor, the best of John Fahey, John Martyn, and the most meditative lines Richard Thompson has ever played”. 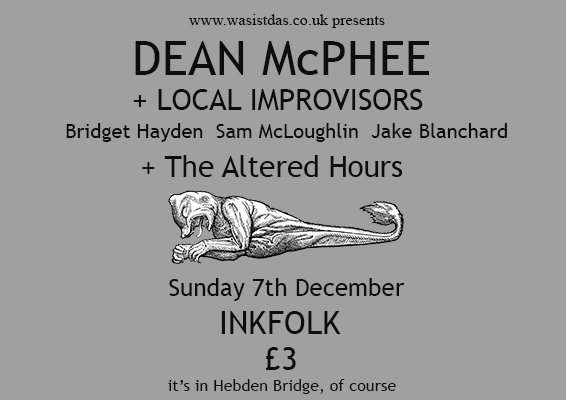 Local Improvisers is a new Todmorden trio consisting of Sam McLoughlin (Samandtheplants/N.Racker), Bridget Hayden (Vibracathedral Orchestra) and Jake Blanchard. Formed initially to do a live soundtrack to a screening of Nosferatu last Halloween, they’ve decided to carry on the good work and play music with the constraints of a film dictating what they do. Last minute welcome additions to the bill are Irish shoegazer noisepop band The Altered Hours. They’ve just done a couple of EPs but have already attracted great reviews and were taken to Berlin to record for A Recordings, home of psychedelic pioneers The Brian Jonestown Massacre, Dirty Beaches and Magic Castles. Admission is just £3 and hopefully the new festive Was Ist Das? compilation tape will be ready and on sale. This entry was posted in Our events, Past events and tagged 2014, Bridget Hayden, Dean McPhee, Inkfolk, Jake Blanchard, Local Improvisors, machpelah works, Sam McLoughlin, The Altered Hours, Vibracathedral Orchestra. Bookmark the permalink.